This simple map holder can be made from common items found in nearly any Wal-Mart store. 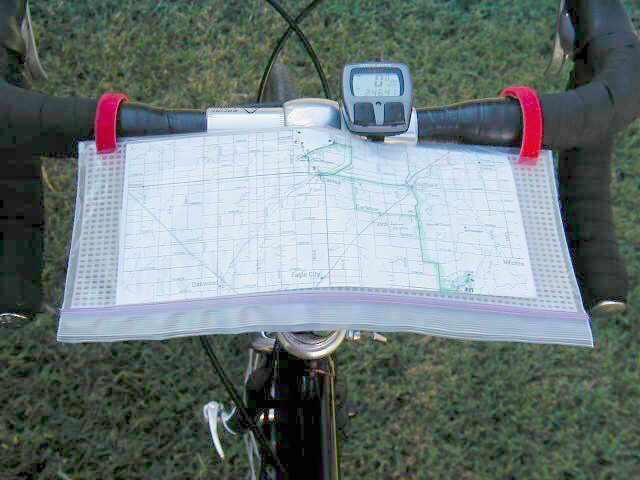 It holds the map flat even when there is a breeze or when making your own breeze on the bike, and it protects the map from rain. It will display a little more than a third of an 8-1/2 x 11? sheet. The “cord keepers” are sometimes in the electrical hardware department, or sometimes in the computer supplies department. If you don’t find them at Wal-Mart, try a home center store (Home Depot, Lowes, etc.) or Radio Shack. 2. NOTE: The cutouts in the center will be used to secure the map holder to the handlebar stem on your bike. You may need to adjust the exact location and spacing depending on your stem length and diameter. Put the plastic canvas inside the storage bag, and adjust it so it is right up against the bag’s zipper. Using a ruler, make a line across the bag about 1/4? beyond the edge of the plastic canvas. Remove the plastic canvas and cut the bag along the line, then seal the cut edge with package sealing tape. Reinsert the plastic canvas into the bag and mark the back of the bag where the cut-outs are. Again remove the plastic canvas and make small slits in the bag where you made the marks. IMPORTANT NOTE: For the two center cut-outs, slit the BACK of the bag ONLY. Figure 2 illustrates the cord keepers. This one has been cut off to a length of about 4?. They are normally about 8-10? long. These nifty little items have velcro hooks on one side and loops on the other so they will stick to themselves. NOTE: The shorter cord keeper is used to secure the map holder to your handlebar stem. You may need a slightly longer or shorter piece depending on the diameter of your stem. Pass the cord keepers through the the slits in the bag, and you’re ready to attach it to your handlebars.